Merri Travels on Endurance.net: RAVEN II RIDES FRANCE! After another divine breakfast on the divine patio overlooking La Masselle, I grabbed my riding gear – chaps, helmet, and Raven-in-a-bag, and Stephane Chazel took me on a horse ride in France! 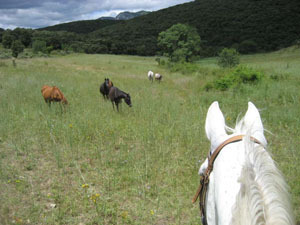 My horse was a gray gelding Jasmin, a 10-year-old Anglo Arabian who's finished his last 3 160 km rides, and his mount was Label, a gray mare he's riding in the 160 km in Florac this coming weekend. His mare was “just a baby,” 8 years old, and Florac would be her first 160. Stephane chose this tough ride for her because she's a big feisty in the rides, and this will show her she has to learn to slow down! We rode off La Masselle and to the winery across the road. “So,” says Stephane, as he nods at the Raven smiling away in his bag attached to the saddle. “Tell me about your Penguin.” Penguin!? Anyway, I quizzed Stephane as we headed up into the hills. He said there are two kinds of trainers – those who train hard and fast and often, and when someone buys their horses, they don't perform; and there's those who train enough to get fit, and when they're sold, they are ready to peak because they haven't been overridden. Stephane's horses that are in training for, say, the qualifying rides (here in Europe a horse must complete one 40 km and one 60 km ride at 12-15 km/hr, then two 90 km and one 120 km rides at open speed with a 56 heart rate before they qualify), they may go out 3-4 times a week for a 2-3 hour ride, mostly walking (it's quite rocky around here). If they're going to a flat ride – i.e. 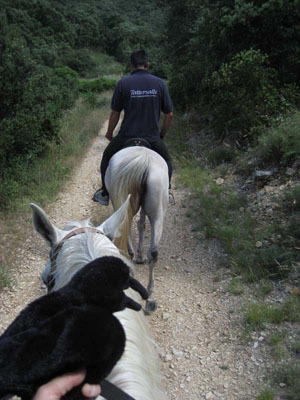 a fast ride – they might do one 35 km canter at the beach where the footing is good. He used to take his horses onto a racetrack to condition, but he found it wasn't good for their minds, so he doesn't do that anymore. Of the horses Stephane brings along in training, the mares are usually bred first, getting 1-2 foals out of them (as was done with Label); they are broken in at 5 or 6, then started in endurance. This way, if they turn out to be good after they are sold, Stephane and his breeder partners still have th bloodlines to keep on breeding. The geldings are usually broken in at 4 or 5, and they spend some time with a friend of Stephane's who runs a horse trekking business. 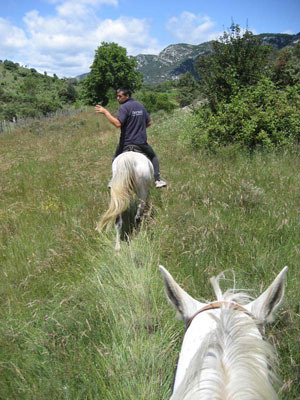 It's good for the horses – they get ridden in the mountains, get used to working and riding around other horses; it's good for the friend's trekking business; and it's good for Stephane who doesn't have to feed them or pay people to ride them at home. Stephane prefers doing 160 km rides, and the mountain rides – like Florac – are much better than the flat races – they're much more of a challenge for the rider. 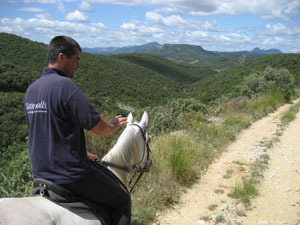 He did Tevis at age 16 in 1984 (“it took us 22 hours!”), and he'd like to ride it again now, exchanging a horse in the Tevis for one of his horses in the Florac 160 km. Anyone interested? In general he prefers riding purebred Arabians rather than Anglo Arabs. “The Anglos don't always have as much up here,” he said, tapping his forehead. And the Arabian has better stamina. And, what about electrolytes? I'd read an article that said the French don't electrolyte their horses during rides. Stephane said No – no electrolytes. What he believes in is first, good breeding, and second, good training. He feeds grass, barley, some alfalfa, a little grain, minimal vitamins, and no electrolytes. “Wild horses ate grass,” he said, “that's what the horse is meant to do.” He's had no problems with metabolics or stomach irritation since he stopped giving electrolytes. One year he took 4 horses to a ride in Jordan where it was 45*. 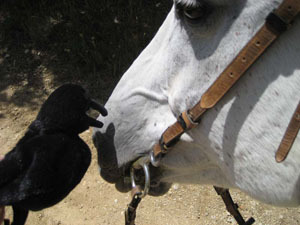 The clients wanted to electrolyte the horses, but Stephane refused. They argued about it, but Stephane was adamant. “You pay me 50% now, and 50% after the horses complete the ride.” He took the horses there 5 weeks early, and only did a minimum of training, with only 1 day of a long fast training ride. People thought he was crazy, but all four horses finished the ride in the top ten. Our 2 ½ hour ride took us up into the green, rocky hills, past vineyards, olive tree orchards, fields of green grass (“Grass is good this year”), old old farmhouses, and the ruins of a castle on a little hill. We looked at a few of his turned-out-growing-up horses, yearling to 4-year-olds, turned out with a 26-year-old retired babysitter endurance gelding. We had a little canter up a field, and Jasmin had this very controlled, huge rocking chair canter stride. Wow, I bet he's fun in an endurance ride! Although I could have gone on forever, and it certainly looks like the trails do, we made a loop and rode back onto La Masselle. So now add France to the growing list of Raven-ridden countries!